Welcome to day 27 of 30 Days of Getting Results, based on my book Getting Results the Agile Way. In day 26, we learned how to solve problems with skill. Today, we decide to do something great. Sometimes in life, you have to decide … at least one more time … to be The Little Engine that Could, even when you think you can’t. When you decide to do something great, your life takes on new meaning. You instantly chart a new course. Your life goes from ordinary to extraordinary. You decide that what you do will make a difference, that what you do will matter, and that will give what you do all that you’ve got. And, If you’re going to go down, then you’re not going down without a fight. But failure isn’t even an option. It’s not even on your radar. In your mind, you can see the prize … front and center … and larger than life. It’s the path and you’re on it. With all your might, and maybe even a little magic, you’ll move whatever mountain stands in your way. It’s onward and upward. It’s time to do something great. Decide what great thing you will do. Don’t swat at flies. Get the dynamite out. Pick something great. This is your chance to say, “I’m going for it.” This is your chance to fight with all your might and make it happen. This is not a time to pick something mediocre. It’s time to knock the ball out of the park. It’s a time to pick something fantastic. Make it epic. It’s Frodo getting rid of that stinking ring. It’s Rocky getting back his “Eye of the Tiger.” It’s making like a Dead Poet Society and seizing the day. It’s Edward finding the joy in his life, Bucket List style. It’s Rudy against the odds, fulfilling his dream. It’s Danielson whipping out the Crank Technique with a final blow when he’s literally down on his last leg If you’re not crying, or you’re not furious, or you’re not elated, or you’re just not feeling it, then you haven’t found it. It’s not about doing one more thing you can do. It’s doing THE thing you MUST do – finding your calling, the one that’s here now, and answering the door. Just for this month, you do put all your eggs in this one basket. Concentrated effort amplifies your impact. Because it’s just a month, you can prioritize it over other things. Because it’s just a month, and not forever, you can give it your all. By making it your theme for the month, it helps you focus and harness all of your discretionary energy, focus, and time. This is your secret recipe for doing great things. To do something great, do it everyday. Carve out a little time more time each day, to invest in your great thing. You don’t know when your breakthrough might happen. Serendipity is a part of life and often a part of success … Tee up more possibilities in your life, a day at a time. Each day is another chance. Doing something every day, even just a little bit, gets easier as you go, and helps build momentum. Time and again, I found that daily action, even baby steps, is how I consistently got over humps or created breakthroughs. Mindsets and metaphors. You can switch your mindsets by switching hats. Put on your explorer hat or your “solution” hat or your “thinker” hat or your “doer” hat. Use metaphors that serve you. The right metaphor can help you move mountains. 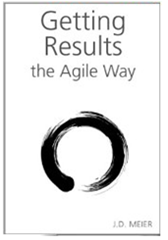 Agile Results. Get the system on your side. By using the three stories each day, week, and month, you’re connecting you’re wiring your mind, body, and emotions to achieve great things, as well as deal with the setbacks, and bounce back stronger and faster each time. It’s the “feet of clay” scenario. People aren’t heroes, they do heroic things. The point is, don’t miss the good because of the bad, and don’t get caught up in putting people on pedestals. Don’t put yourself on a pedestal either. Instead, focus on doing a great thing and giving it your best shot. 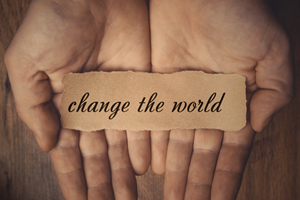 Stephen Covey, Randy Pausche, and others remind us that nobody regrets the things they did. They regret the things they didn’t do. Don’t let fear run your life. Especially fear of failure. What if you try and you fail? …So what. Guest what? If you have to succeed, then you’re playing the game of life wrong. Test your possibilities. Grow from it. Embrace the experience. That’s what life is all about. If you gave it your best shot, you . You grew yourself a little more, or maybe a lot. … but that you’ll give it your best shot. Don’t depend on external validation too much – that’s the best way to kill your motivation on a daily basis. Don’t hold your breath for your manager’s acknowledgment, or your spouse’s appreciation, or the audience’s applause. It’s a wonderful by-product, but it can’t be your driver. First and foremost, impress yourself first. Remember to connect it to your values and your internal bar … your internal rewards … and then you “balance” with external rewards and appreciation. That’s how to make great things or do great things and stay on fire. Giving something your best shot is within your control. The results are not. The best you can do, is give the best you’ve got, test your dreams with skill, and roll with the punches. And when you get knocked down, the single best thing you can do is get up again. You never fail unless you give up. Get ready to make next month one of the most exciting chapter in the story of your life, as you continue to write your story forward.